You are here: Home / Brent & Vicky H.
Brent and Vicky H. are two hardworking and loving parents dedicated to giving their eleven children the best they can. 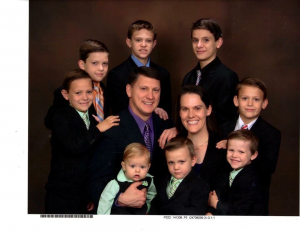 Their children include John (17), Daniel (15), Benjamin (14), Joseph (11), David (10), Michael (8), Stephen (7), Luke (4), Anna (2), Joshua (1), and baby number eleven is due in February. With nine boys, the family enjoys outdoor activities like fishing, riding bikes, sports, camping, and hiking. Vicky likes to crochet and Brent loves spending time outdoors. Vicky is a stay-at-home mom that often volunteers with the Christian Life Center, and Brent is an educator.